Good mornin'! We just finished a freeeeezing tour in Sarajevo, where it is -10 C... brrr. 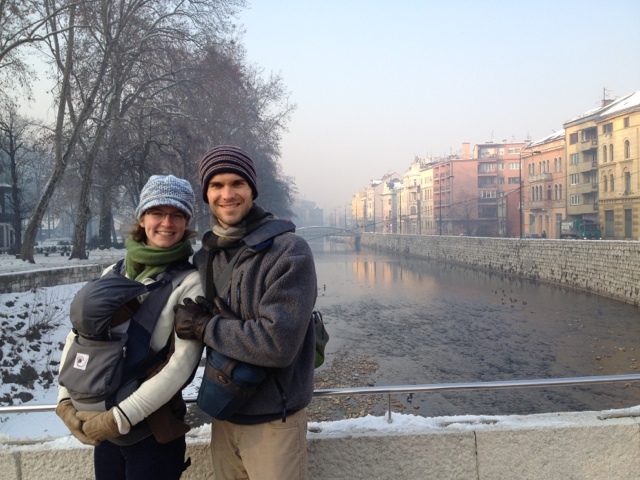 Here's a picture of our little family on Assassination Bridge, right near the corner on which Archduke Franz Ferdinand was shot and WWI began. Off to Mostar, Bosnia, this afternoon! Now that we have this Blogger mobile app figured out, I'll try to keep posting photos and videos here as we travel. we are happy for your cold adventures and your joyful smiles!